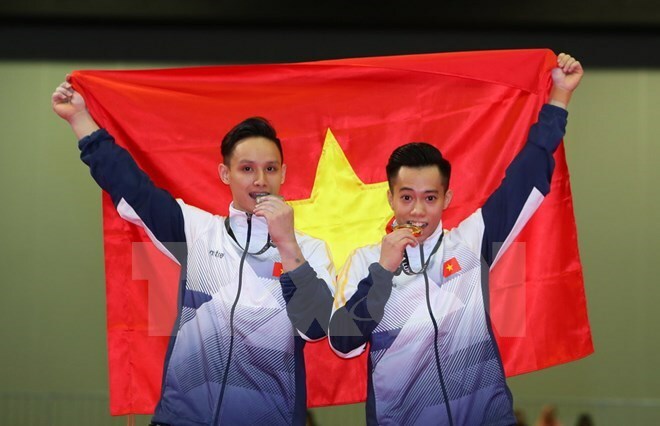 Kuala Lumpur (VNA) – The Vietnamese gymnastics team pocketed more medals on the morning of August 23 at the ongoing 29th Southeast Asian (SEA) Games in Malaysia. Le Thanh Tung bagged one more gold medal in the men’s horizontal bar category with 13,350 points. It was his second gold medal after the first one in the men’s vault. His teammate Dinh Phuong Thanh took the silver medal in this category with 13,050 points. Thanh triumphed in the men’s parallel bar with a score of 14,900 to bring home a gold while another Vietnamese gymnast Pham Phuoc Hung bagged the silver medal by scoring 14,150. Jamorn Prommanee of Thailand earned the bronze medal with 13,850 points.